College basketball players who declare for the NBA draft can still play for the university under new rule changes that reduce the dilemma for talented players, a move applauded by two Phoenix Suns players. Devin Booker, who left college after one year to become the NBA’s youngest player as a Suns guard, said college ball players face less risk of having to play overseas if they aren’t drafted. Until January, student athletes who declared for the NBA Draft forfeited their right to play for their college team under National Collegiate Athletic Association rules. That meant if a college player submitted his name into the draft but wasn’t chosen, he had few options. The most popular choice among players was to play overseas in Europe or China for a couple of years, hone their skills, hope they caught the attention of the NBA, signed a minor-league deal and worked their way up to the NBA. That’s what happened to Arizona State University basketball standout Jahii Carson, who played for the Sun Devils from 2012 through 2014. Carson declared for the NBA draft after his sophomore year and was not drafted. No longer eligible to play for ASU, he played in Australia and Serbia. He now plays in Turkey but has not yet made his way back to the states. College players no longer risk losing their college eligibility. Under the new NCAA rules, college players can enter the NBA draft as many times as they want, including in the so-called draft combine, where they showcase their skills in front of NBA scouts and can try out with one team per year. “I like it. 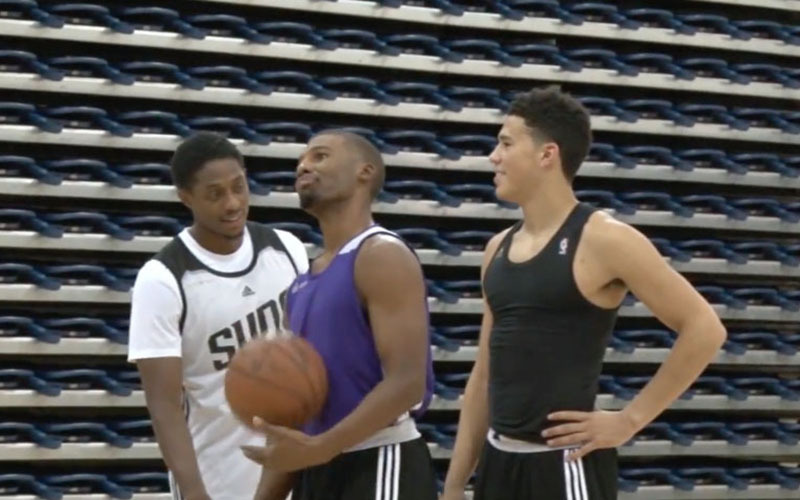 People get to see what the NBA is saying about them,” said Booker, who left the University of Kentucky after one year to become a 2015 first-round draft pick for the Suns. Booker said the new rule protects student athletes from having to play overseas if the NBA doesn’t draft them. Suns guard Ronnie Price, who played at Nicholls State University in Louisiana for one year and Utah Valley University for three years, said he would not have exercised the new eligibility rule when he was in college several years ago. Earl Watson, Suns head coach, said that education is more important than the lure of a multi-million contract from the NBA. “After you get done playing basketball you can live off your experiences in school and your relationships you made in college,” Watson said. The NCAA now also allows students to change their minds once they’ve put in their names for NBA draft, within a specific deadline. “Whatever rule they put in place to kind of help guys make a quicker decision or better decision that best suits their career, then I’m for it,” Price said.